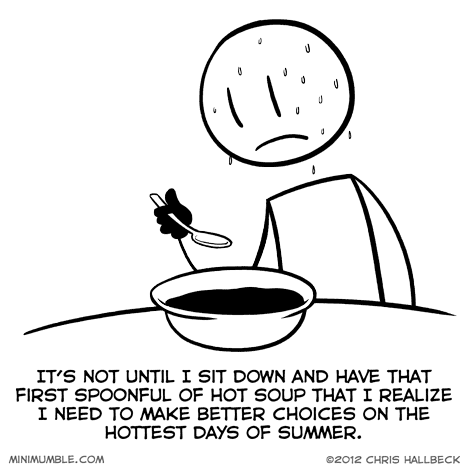 I had a huge bowl of Pho Thai on the hottest day of the year, with plenty of hot sauce. I was sweating up a storm, but it was my only chance to have soup from the place that makes it best. I do the same thing with tea. Multiple times a day. I always have hot drinks in the summer and winter and Ice Cream in the summer and winter. They’re all year round foods. At this point, at least pass on the Cherries Jubilee. Wasn’t he one of the Marx brothers? Gazpacho Marx? I’ve tried it; it helps sometimes. And then there were human puddles.